Ingredients: Ripe Banana, Cashew nut, Grated Coconut, Cardamom powder, vegetable oil, Refined wheat flour, Rice flakes, Molasses, cumin. Peel the ripe banana and trim both the ends then make a batter with refined wheat flour, salt, cumin and water. Make a mixture of rice flake, jaggery, grated coconut, cumin and cardamom. 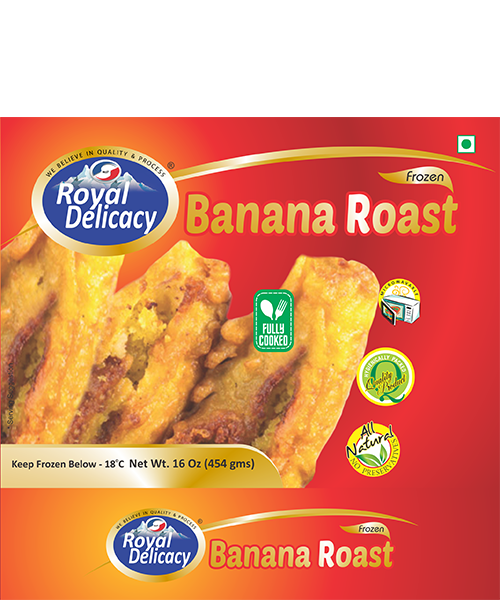 Take a peeled banana and make a shallow slit length wise then filled the slit with mixture and dip the banana in batter, Deep fry the banana in hot vegetable oil until they become golden yellow. Then pre-cool the product before blast freeze at -32 °C and pack and stored at – 18 °C. The procedure is carried out so as to assure that the product is free from any type of contamination.